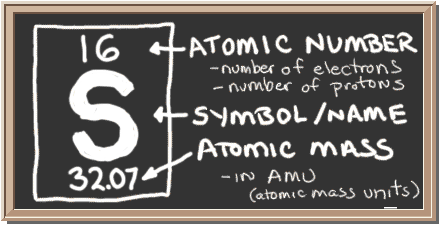 So... for the element of SULFUR, you already know that the atomic number tells you the number of electrons. 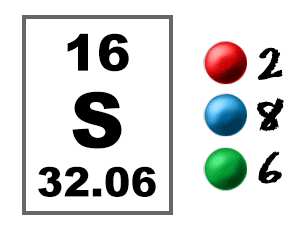 That means there are 16 electrons in a sulfur atom. 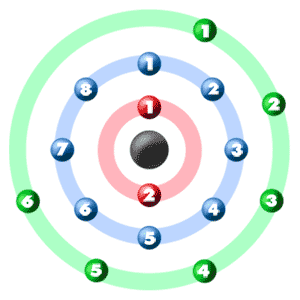 Looking at the picture, you can see there are two electrons in shell one, eight in shell two, and six in shell three. ► More about the history and places to find sulfur. Two hydrogen (H) atoms can bond with one sulfur (S) atom, making the formula H2S, also known as hydrogen sulfide. The same way that oxygen is happy when it has two extra electrons, sulfur likes to have two extras as well. See how the sulfur atom gets to share each of the electrons from the hydrogen atoms? Two hydrogen (H) atoms can also bond with two sulfur (S) atoms, making the formula H2S2. That's just one more sulfur than H2S, but it's a totally different compound. See the name and how it's di-sulfide? The "DI" means two sulfur atoms. You can see that each of the sulfur atoms has eight electrons, and the two hydrogens have two electrons each. See how the electrons are shared?